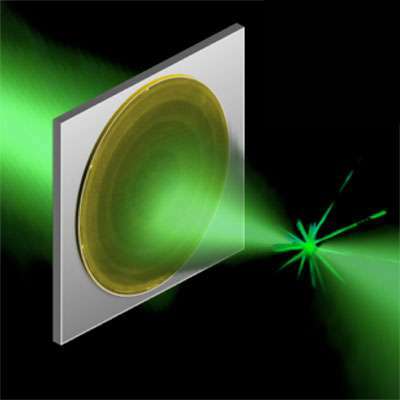 Metasurfaces are a promising type of new nanophotonic technology. A metasurface was recently used at Harvard to create an ultrathin, flat lens that focuses light without imparting the optical distortions of conventional lenses. Credit: Francesco Aieta. Federico Capasso, Robert L. Wallace Professor of Applied Physics and Vinton Hayes Senior Research Fellow in Electrical Engineering, will lead this Multidisciplinary University Research Initiative with a world-class team of collaborators from Harvard, Columbia University, Purdue University, Stanford University, the University of Pennsylvania, Lund University, and the University of Southampton. "This is one of the world's strongest possible teams," said Capasso. "I am proud to lead this group of people, who are internationally renowned experts in their fields, and I believe we can really break new ground." Recent research by Capasso and others in the field has demonstrated that with the right device structure, the critical manipulations can actually be confined to the very surface of the material—what they have dubbed a "metasurface." These metasurfaces can impart an instantaneous shift in the phase, amplitude, and polarization of light, effectively controlling optical properties on demand. Importantly, they can be created in the lab using fairly common fabrication techniques. "Can we make a rapidly configurable metasurface so that we can change it in real time and quickly? That's really a visionary frontier," said Capasso. "We want to go all the way from the fundamental physics to the material building blocks and then the actual devices, to arrive at some sort of system demonstration." "Just 20 years ago, the notion that photons could be manipulated at the subwavelength scale was thought to be some exotic thing, far fetched and of very limited use," said Capasso. "But basic research opens up new avenues. In hindsight we know that new discoveries tend to lead to other technology developments in unexpected ways." The research team includes experts in theoretical physics, metamaterials, nanophotonic circuitry, quantum devices, plasmonics, nanofabrication, and computational modeling. Co-principal investigator Marko Lončar is the Tiantsai Lin Professor of Electrical Engineering at Harvard SEAS. Co-PI Nanfang Yu, Ph.D. '09, developed expertise in metasurfaces as a student in Capasso's Harvard laboratory; he is now an assistant professor of applied physics at Columbia. Additional co-PIs include Alexandra Boltasseva and Vladimir Shalaev at Purdue, Mark Brongersma at Stanford, and Nader Engheta at the University of Pennsylvania. Lars Samuelson (Lund University) and Nikolay Zheludev (University of Southampton) will also participate. The project, titled "Active Metasurfaces for Advanced Wavefront Engineering and Waveguiding," is among 24 planned MURI awards selected from 361 white papers and 88 detailed proposals evaluated by a panel of experts; each award is subject to successful negotiation. The anticipated amount of the Harvard-led grant is up to $6.5 million for three to five years. Harvard SEAS will also participate in a second MURI, the Department of Defense announced this month. Efthimios Kaxiras, John Hasbrouck Van Vleck Professor of Pure and Applied Physics, is a co-principal investigator on a team of physicists, chemists, mathematicians, computational scientists, and materials scientists who will use multiscale modeling to predict and design new functional materials. That project will be led by Mitchell Luskin at the University of Minnesota.